Red Alert! The Red Sox Have an Official Red Wine! Who knew? It turns out the Olde Towne Team has an Official Red Wine, as readers of today’s Boston Globe discovered in this full-page ad. Chateau Auguste certainly seems to be a hit with oenophiles: A quick check of the Googletron reveals that the 2017 Rosé featured in the ad rates from 3.4 to 4.5 stars; the 2015 Bordeaux in the background gets 4 stars. We’ll see how it plays at Fenway, though. 1) The ad got us to wondering who else might be an official sponsor of the Sox. We know – from all those delivery trucks – that W.B. Mason is the Official Office Products Supplier of the Boston Red Sox (and also sponsors the Philadelphia Phillies, New York Yankees, New York Mets, Cleveland Indians, Pittsburgh Pirates, Washington Nationals, and the Tampa Bay Rays, along with the NHL’s Boston Bruins). 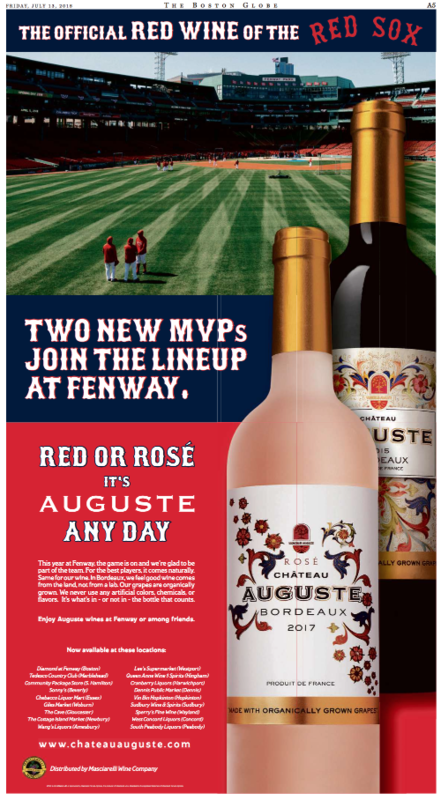 2) The Chateau Auguste ad did not run in the Boston Herald. That makes it the thirsty local tabloid times two. This entry was posted on Friday, July 13th, 2018 at 3:30 pm and is filed under Uncategorized. You can follow any responses to this entry through the RSS 2.0 feed. You can leave a response, or trackback from your own site.